For a while I tried to figure out why he picked the fridge. Ours is only about four years old and works just fine. I can’t remember ever complaining about it or yearning out loud for a fancier model. Why not a new car or bigger house? And there’s also this: I beg my boys for affection almost every minute I’m with them. I tell them at least a dozen times a day that my favourite times are when I’m around them and that I just can’t get enough of their hugs and kisses. And Deaglan is always sweet and generous, promising me “armpit” or lots of kisses when we’re together again. Naveen however is a different story. He doles his love out like it’s the day after the apocalypse and he’s holding the last loaf of bread. He’s stingy and downright arbitrary – you can never guess when he might give you one of his mushy-lipped smooches or flat out refuse you. Recently though we’ve discovered a loophole. If he thinks you’ve hurt yourself, he’ll run over with great concern and kiss the place you claim you’ve hurt. I probably should be ashamed to tell you this but I pretend to be hurt all the time. My point is though; I don’t know where Deaglan got the idea that he had to buy something to show how much he loves me. But then again I’ve never been any good at math. 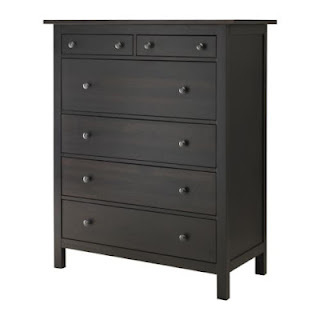 I mean if the giddiness with which I’m looking forward to my new Ikea dressers arriving just in time for my birthday tomorrow is any indication of how not-materialistic I am – I can’t imagine why my son might think things make me happy. I’ll tell you what will make me happy. Not having our bedroom look like the showroom at Goodwill. Not that there’s anything wrong with used furniture, I’ve been quite proud and forthcoming about my curbside finds. But I’ve been dreaming about these two charmers for some time now, swooning at the thought of having enough room for all of our clothes. 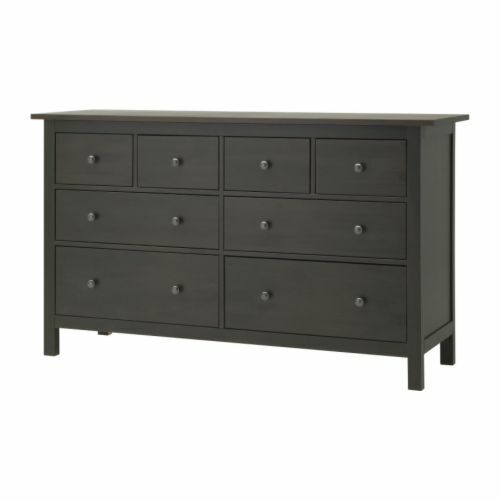 And so when Shaune asked me a few weeks ago what I wanted for my birthday, I’m sure he expected me to say the usual - I have everything I need, but I responded with only one word - "Hemnes!" And a few mornings ago, after disciplining Deaglan a few times about smashing Naveen's toy vacuum into the fridge, it dawned on me why he picked that particular appliance to gift me in the future with. He's made just about every dent on it's stainless steel surface. Sweet, practical and repentant. Some lucky woman is going to thank me one day! Oh I love how he worries about kissing the hurt away. So very sweet. Love this post Kim. This so could have been written by me a few years ago! I, too, am guilty of having used the "I hurt myself" tactics, simply to get a kiss or a snuggle. You're raising such sweet boys! This was great. Figuring out why he chose a fridge was awesome. Thoughtful boy and you're right, he will make someone very happy someday. Aww, he feels bad he dented the fridge! Hope you get your dressers for your birthday! For a while, I was longing for a headboard for our bed, but I've kind of forgotten about it since having kids, lol. Love those dressers Kim! And early happy birthday too! Sometimes what I love best about your posts is the pure joy they give me. I may be at a loss when it comes to leaving a profound or meaningful comment, but please know how much I love reading what you put down here. Well I'd be giddy about those dressers too!! Happy Birthday, friend! Wishing you a Happy Birthday filled with unsolicited hugs and kisses and rock star bedroom furniture! And those two dressers are great - I love that style. Very clean-lined. Oh my that's precious!! What a caring little guy he is! I'm praying you get your heart's desire very soon!! Thanks so much for your comments the other day! Weirdest thing is that they came to my email, but did not post on the blog. Hope your children can buy a new fridge and give you as a gift.